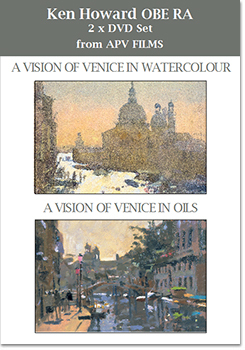 Painting 'contre jour' with the intense light reflecting off water, roof tops or piazza, Ken builds up his watercolours with wash upon wash of transparent colour. 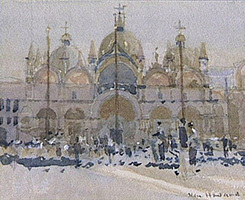 Often working on two paintings at the same time, one on each side of his board, his subjects include St Marks Square, the Salute, Campo San Angelo and the fish market. In this film we see Ken painting three views of the Salute, showing the difference in tonal values as the light changes from early morning "contre jour" to late afternoon. 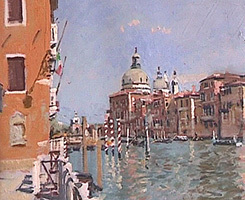 He also paints looking up the Grand Canal in the evening light and a view of a back street canal on a quiet Sunday morning.